February is when everything kicks off at church. As I write, I'm sitting in a corner of the HUB watching the setup for Women's Growth Group. I'm struck by how generous and content our people are. But I’m also struck by the leaves blowing in, the hard concrete floors, the insulation peeling from the ceiling... the fact that we have to wrestle with every venue to make it work for people. Won’t it be great to have a venue that works! A venue that’s bright, clean, comfortable to be in, comfortable to invite people to…. Of course it won’t be perfect. We wouldn’t want a building that’s perfect: imagine putting that first mark on a wall! But we are praying for a home that helps our family life rather than hinders it. Keep praying for the search. New buildings come onto the market all the time and our Father knows exactly what we need. I’m excited to find out what he has in store. So far over $1.13m of the pledged donations to the building fund have come in. That means there's just over $700,000 in pledged donations still to come in before August. We'll be sending out a Donation Summary to people who pledged in the next few weeks (if you haven't got one, please email building@hunterbiblechurch.org). Thank God for the Leaders, the Volunteers, the helpers, the kids, and all the work that went into WAVE. We had over 600 unique kids and there's been a bunch of kids come to Youth and Rush and adults who've come to Life! Please pray that God would keep using the work done through WAVE to bring people to himself. Summer Sessions is the unichurch Summer Bible Study. It's a great chance for Unichurchers to invite friends along and kick-off the year well. 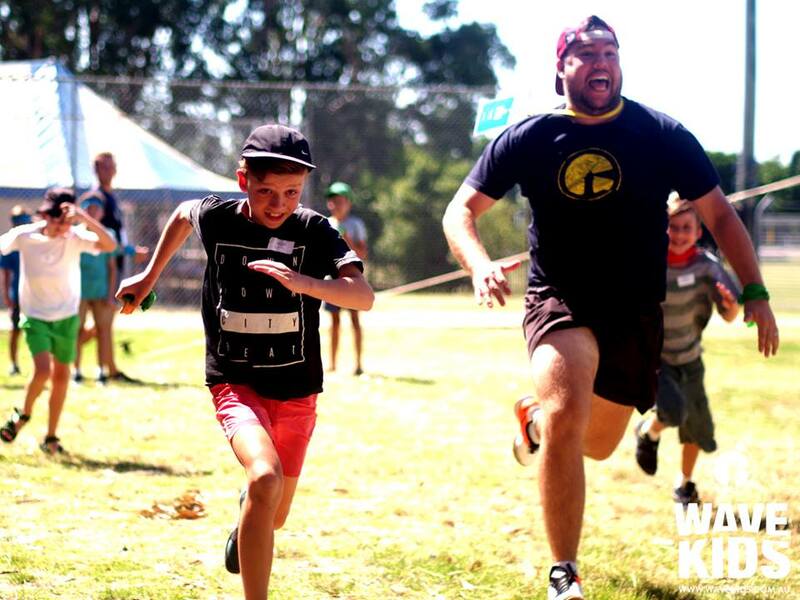 Pray that those kicking around Newcastle for holidays would not give up studying the Bible together, and Summer Sessions would help Unichurch prepare for O-Week. AS 2018 starts, several of our Ministry Teams have been gathering to get prepped and trained for the months ahead. Please thank God for our Growth Group Leaders (and those who lead and look after them). And thank God for our musicians, sound techs, singers, etc. who love us each Sunday as we gather to rejoice in the gospel. We have 5 new MTS Apprentices starting at HBC this year. In January they started their training by going to the National MTS Orientation Conference called "G8". Please pray for all 9 of our MTS Apprentices and their trainers! A small team from HBC went to Myanmar in January to visit Lincoln and Leah, the RBI college and Dave P. Dave Moore ran several Pastor's training conferences, helping them become better bible teachers and challenging some of their ideas too. Please pray that the gospel would grow in Myanmar; that those who are culturally "Christian" would know Jesus truly, and that millions of others would hear about Jesus. We have a wonderful team of people who love our little kids at Lil's Buds every week during Women's Growth Group, teach them about their Heavenly Father and serve women who wish to read the bible with others. Women's Growth Group and the leaders enjoyed lunch together after their weekly meeting on the 31st of Oct and 2nd of Nov. It was wonderful to spend time with the Little Buds leaders, a chance for mums to get to know the team better and enjoy a meal together. Thank God for the ministry of Lil' Buds that frees up women to read the bible, grow their relationship with God and encourage each other to live for Jesus. Thank God for the Lil' Buds Team as they love and serve our 0 - 5 yr olds. Earlier in November, we had our Gospel Investment afternoon where we gathered to hear the plans and prayers for our church in 2018. Greg looked back on the highlights of 2017, we heard an update from the Building Acquisition Committee and announced our new budget for 2018. Pray that as a church we would continue to be driven by a vision to see people grow in faith and to reach Newcastle and Lake Macquarie with the gospel. You can see the budget for 2018 here. On the 8th of November, Reality, the college bible study, had their farewell. We said goodbye to those moving off college next year and those going back to their home countries. It was a great night eating food, playing games and listening to God's word. Please pray that as Uni breaks up for the year, the students will keep digging into God's word, and growing in their love and knowledge of him. During mid-November, some of our senior staff gathered for a few days to pray and plan for the next season of serving Jesus' people at HBC. This time together included reading God's word, thanking God for the his work in and through our church over the past few years and asking for his help in the future. This came after attending some encouraging conferences over the past few months, including the FIEC (Fellowship of Independent Evangelical Churches) Conference, and gathering with past MTS Apprentices at MTS Mission Minded. Please thank God for our pastors and pray that God would keep them and use them for his glory. 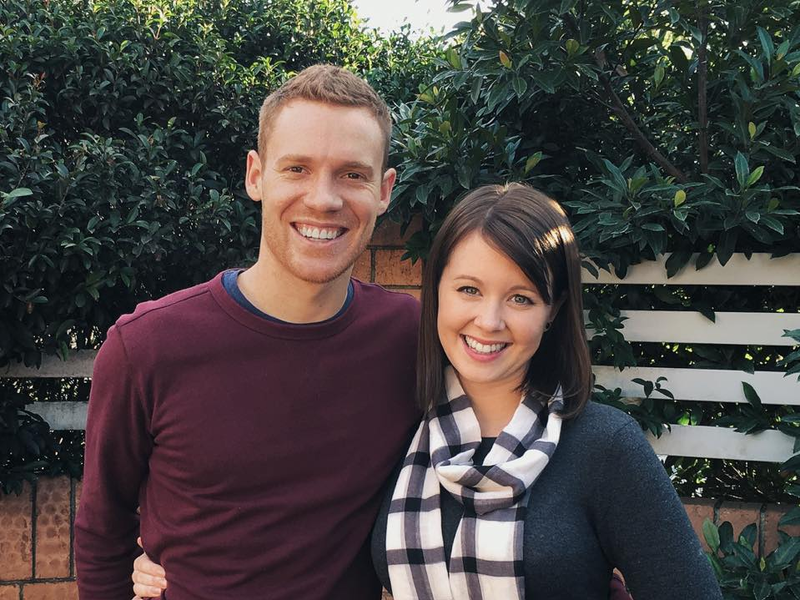 We're very pleased to announce Anthony Allen will be joining the staff team to fill the Youth Pastor position. Anthony and Laura have been around HBC for years and he's been working at Compassion after completing MTS with us a few years ago. Please pray for the 30,000+ youth aged kids in Newcastle and Lake Mac... that God would use HBC to reach many with the gospel of Christ. Our whole church family gathered together in one place on Sunday 27th. It was awesome! Loads of little groups eating together, kids running around… jumping castles! We asked God to glorify Jesus though us, and through any building he might choose to give us. Please continue to pray for these things. You can listen to the talks online. In the meantime it’s not too late to tell us your pledge. Lots of us are still thinking and praying for wisdom about how much to give or increasing our gift. Every pledge and donation helps our building team have a better idea what we have to work with. In the lead up to BIG Sunday, our whole church family had the chance to gather and Pray for A Home With Purpose. This included an opportunity to ask Greg (and the Building Acquisition Committee) any questions that were floating around. They were both great times of fellowship, thanksgiving and prayer. 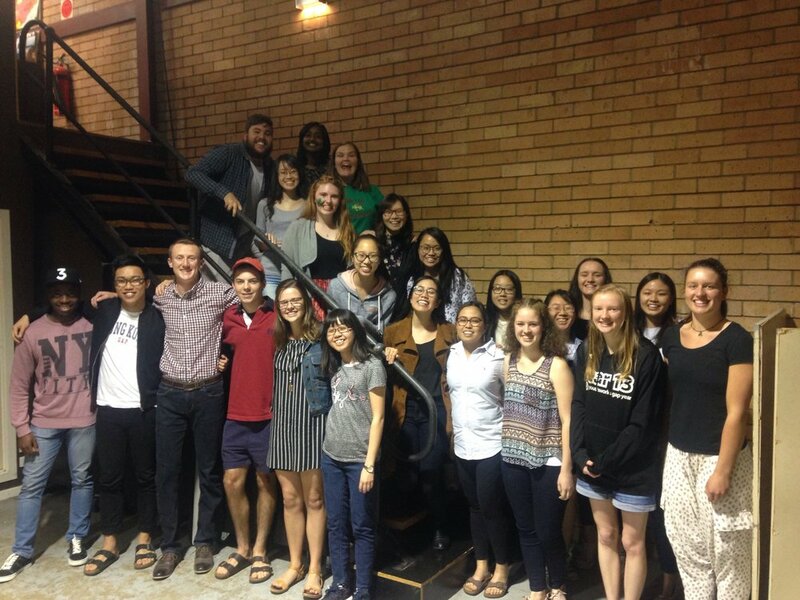 Throughout the year many international students come and go from Unichurch and the AllNations group. One of the students talked about his return and how the government opposes the house church he attends. He would normally remove the sim card and battery from his phone to avoid being tracked while at church. Please pray for our International brothers and sisters as they spend time with us in Newy and that they return home stronger, or in many cases, saved in Christ! The Life Series has just finished up after 5 weeks of people coming along to check out who Jesus is. The Series is so important because there’s no other name in heaven or on earth by which mankind can be saved. Praise God for the 21 people heading along to both The Life Series and AllNations Life. The next LIFE Series starts on 12th October at 7:30pm. 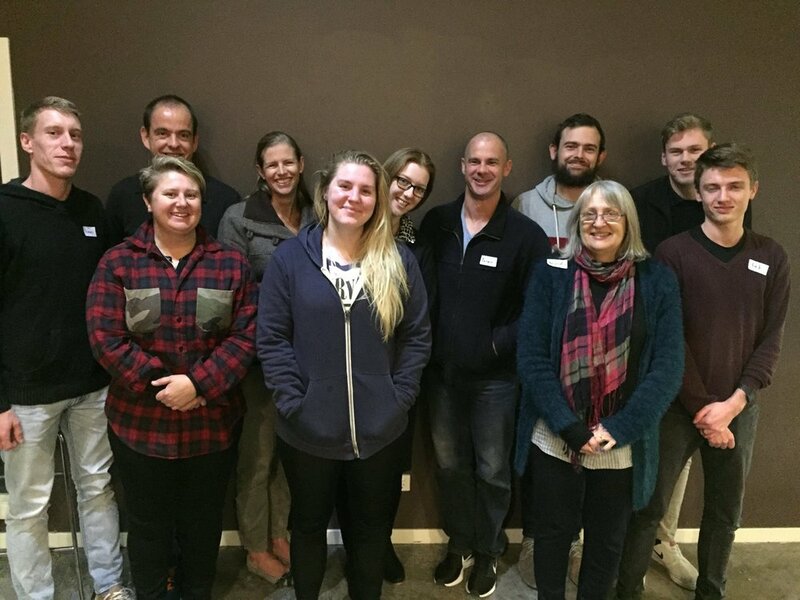 AIM Training day was held on Saturday 12th August for the team of 13 people who will be travelling on the Mission Awareness Tour around outback Australia for two weeks, in the September holidays. The training day helped the team get to know one another and to think through Gospel mission in different parts of Australia. The team is looking forward to seeing how God is growing his kingdom through various ministries around Australia. Please pray that the team will develop a passion for mission, and grow in their understanding of Indigenous mission work. Pray also that the team will be preparing well prior to their time away. HBC's women had a great opportunity to gather as a family and watch a live stream of the Equip Women's Conference at the Hub on the 27th. One of the best things about Equip17 LiveStream is that ladies from AM, PM, LakeMac and Unichurch get to spend time together, encourage one another and spend time in God's Word. Pray that we would value Gods word and listen to it. Pray that we would continue to think through the roles of men and women in church and how we can glorify God. Please take a moment to pray about our church finances. After a good start this year, our giving has struggled to meet budget and cover all our expenses for the past few months. Please prayerfully consider God's desire for every Christian to cheerfully and generously give to their church. If you haven't started giving regularly, or you think you should be giving more, please act soon to arrange a regular gift to the church bank account or set up a direct debit to church. See some thoughts on God's giving principles. 30 couples from different services attended the HBC Marriage Seminars. They looked at how to create deeper intimacy through meaningful communication and explored relationship roles in a Christian marriage. There was laughter, some tears and, at the end, many beaming couples. Dave Allen even arranged for free babysitting so many were able to go on a child-free date that night! Give thanks for the people who came to babysit children and thank God for the opportunity these couples had to come together and work at deepening their relationships. Pray for them as they seek to apply what they learnt in the coming months. The day challenged our Kids Team to keep handling God’s Word carefully and make sure passages are distilled for children rather than watered down. Everyone came back with a heap of practical tips that they can put into practise. Keep praying for all our leaders to keep being grown by God’s Word themselves, to be diligent in their preparations and for energy to keep engaging their kids with the wonderful message of the risen Lord Jesus, even when it is hard. The Tuesday Little Buds Team were the guest of honour at a Tuesday Women’s Growth Group lunch on the 16th. Butter chicken, salad, roast chicken, chocolate raspberry muffins and much more was enjoyed by the Little Buds Leaders alongside the Women’s Growth Group ladies and the kids. The ladies were keen to show their appreciation to the team for loving and serving the kids each week. Please keep praying for Sam Koster, Laura Reed and their teams that they would teach the Bible clearly to the kids each week. Rob and Jenni Alley from Australian Indigenous Ministries visited us on from Taree. They ran an info session with a bunch of people who are interested in attending the Mission Awareness Tour they are running in September. Please pray that the trip in September will be a great time of growth for those who attend, and that they will come away from the trip keen to live for Jesus and passionate about the work God is doing in Aboriginal communities. Please keep our pastoral staff team in your prayers. Over the past few months, we've been getting help from other Christian groups, as well as being able to provide support to others also. We recently hosted a church management forum with pastors from England, Australia and America involved. Please join in praying for our leaders and for the growth of faithful churches around Australia and the world. As we approach buying a building, August 27 is going to be an important day in the history of HBC. We're planning a Big Sunday; all 4 congregations together from 9.30am - 3.30pm. And it's the type of day that you move mountains to come to. Big Sunday is FREE, but we need to know you're coming so we can organise catering. Please register now. At HBC we're keen to raise up the next generation of gospel workers who will plant and lead churches and ministries across Australia and beyond. We partner with MTS to offer two year hands-on ministry apprenticeships. Contact MTS@hunterbiblechurch.org to find out more. The last two weekends of June, our AM, PM and LakeMac congregations did church with kids-in! Each meeting saw kids and adults singing, learning and doing actions as they looked through John 5. Thank God for the chance to have all-ages in church and for our wonderful kids team leaders. On the 2nd-4th of June, LakeMac had a weekend away to Toukley. 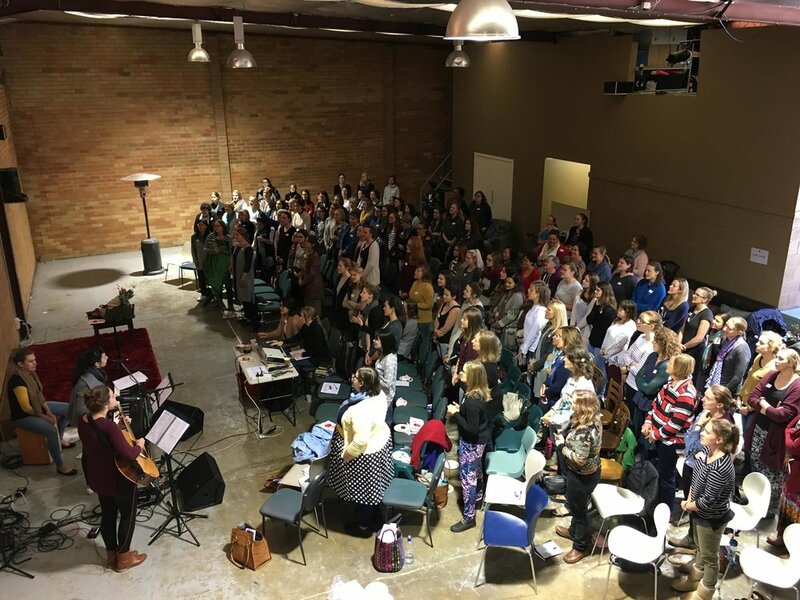 It was a an opportunity for the LakeMac congregation to get away for the weekend, to sit under God's word and invest time into one another as a family. Greg preached five great talks on Jesus as God's Right Hand Man (The Session of Christ) and they had some fantastic seminars on living for Jesus in marriage and singleness. Pray for the HBC:LakeMac congregation that their lives - their godliness, their mission, and their decisions - would be about Jesus and His glory. Joining a church is a big deal because God loves us and gathers us together as his people. The New Members Dinner was an opportunity to celebrate with people who have joined us this year. 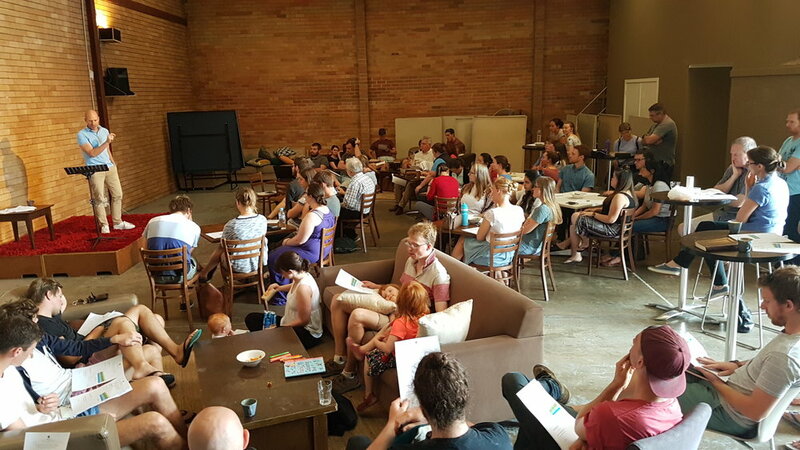 We had around 25 people come along and we got to chat about what God has done in the life of our church so far and what we are looking forward to God doing in and through us. Give thanks for all the people who have come along and decided to join us this year. Pray for them to keep making deeper and deeper connections with people and to feel part of HBC. In May and June we gathered for two events (men and women) to explore what the Bible says about men and women in ministry. At the women's Big Ideas night Jenny Jefferys and Rach Munday did some great teaching on 1Timothy 2 and a reflection on feminism. A long Q&A with Jenny, Jo, Rach and Greg was very helpful. This topic creates controversy among Christians and in the world, but we were able to see the goodness of God's way: men and women are equally valuable in God's church but at times serve him in different ways in different roles. Pray that as a church both men and women would be glorifying God in all kinds of ministry. On the 10th, Unichurch couples attended a marriage seminar at The Hub. It was an awesome afternoon which allowed them to think about how their marriages help them do the ministry of building God’s kingdom. They were encouraged to love both singles and married couples around Unichurch, remembering that their job is firstly to serve Jesus. Pray that all our married couples would be seeking to glorify God in their marriages. Winter Warmers has kicked off whilst Unichurch Growth Groups are on pause over the holidays. Unichurchers have been meeting at the Hub every Tuesday to share a meal together and spend some time studying God's word. Winter Warmers is a great chance for our Unichurch congregation to stay focused on God's word while they are on break from uni and their regular routines. It is a great time of fellowship as a congregation. Please be praying that people will be coming along and continue to grow in God's word over the mid year break. We've been considering a HBC Phone App and we'd love your feedback and ideas! Would you use it? What would you use it for? Should we do it? Let us know! A bunch of our Lambton:AM congregation went away for a day together. Some camped, others just came for lunch, but it was a great day of hanging out together as brothers and sisters in Christ. Welcome to some of our most recent church family members! As people keep coming to know Jesus and start coming to church, we keep hearing how helpful they find NextStep. Be sure to welcome these guys if you see them. This week, we're all skipping Growth Groups to hear and pray about our church plans for 2016 and how we'll manage that financially. 7:30pm, Tuesday at Lambton High School. About 50 HBCers were part of the CityServe day at Hamilton South. These guys were able to help out with some painting and upkeep while getting to encourage some of the Christians there. Keep praying for the ministry happening at Hammo South! While our Lambton:AM congregation was away, our Lambton:PM congregation also went away for the weekend together. Dan Godden helped us see what really matters from John's gospel... Great talks to listen to here. About 50 HBCers went along to the new MTS Mission Minded Conf to keep thinking through ministry as a career. Thank God for this event and pray for those who went. There was a great turn-out for the 2nd "Big Ideas" nights as Richard and Greg worked through the idea of Gender and Sexuality. Look out for other "Big Idea" nights coming up soon. It's been great thinking over the huge implications of God's grace launching out of the parable of the prodigal son. Listen to them again online here. Please pray for WAVE2016. The team has already met a few times this year to plan and pray for a great big week. It's all steam ahead for carols! We've got some great sponsorship from local businesses and now we're prepping and praying for great weather! We've launched a new HBC website that's designed to help people who've never come before to just take that next step and join us. Check it out. This Thursday there's going to be a night of prayer for the Syrian & refugee crisis. Come and join us in prayer for these people. After 6 months home in Australia, Stu and Is are about to go back to South Asia. Come along to pray for them as they go. On Wed Nov 25 we're holding an night to help people think through mental health issues from a Christian point of view. See more details coming soon. Thanks all, I hope that's helpful!